Uncle Milton's Force Trainer II uses holograms and a device that reads brain waves to train users how to use the "force" as presented in the "Star Wars" universe. NEW YORK — Drones, dancing robots and games galore made debuts at the 2015 Toy Fair. Space-age gadgets for kids and adults alike were on display this weekend here at the Jacob K. Javits center in Manhattan. Space.com scoured the aisles of the 112th Toy Fair this weekend to find the best cosmic toys for the 4th annual Space Age Awards. Winner: Uncle Milton's Force Trainer II, available fall 2015, $119.99. 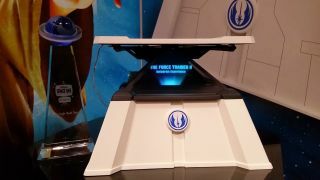 The toy uses a special headset that reportedly reads brain waves as kids (or adults) attempt to get through a series of "Jedi training tasks" modeled from real "Star Wars" scenes. The toy uses a tablet to project a 3D hologram of whatever force task people using the device need to complete. The Force Trainer II is an updated version of the company's Force Trainer I. What we love about it: The Force Trainer II blew us away. It really makes you feel like you're inside "Star Wars," and all space fans should get a kick out of it. Finalists: VTech's ActionCam, a camera with Instagram-like features for kids built in; Crayola's Easy Animation Studio, designed to let kids create their own animated shorts and bring pictures to life on a tablet or a smartphone; and WowWee's R.E.V robotic cars. Winner: The Coop's Tricorder Replica Small Messenger Bag, available now, $39.99. This awesome bag brings "Star Trek" to the real world. Modeled after the TV show's tricorder bag, this sci-fi-inspired piece is functional and geeky. The flaps of the bag reveal the iconic tricorder look, but once buckled back together, the bag could blend in with the crowd. What we love about it: This bag lets your "Star Trek" fan flag fly without being too overt, making for the perfect mix of science fiction and practicality. Finalists: Underground Toys' X-Wing knife block; LEGO's "Star Wars" Tie Fighter; TOMY's Miles from Tomorrowland toys; and Hasbro's Blade Builders lightsaber toys. The Meccanoid robots from Spin Master are fully programmable and buildable machines. Winner: Spin Master's Meccanoid G15 KS and G15 robots, available fall 2015, $399.99 and $179.99. The 4-foot-tall Meccanoid G15 KS and the 2-foot-tall G15 robot were the talk of Toy Fair 2015. Kids ages 10 and up can build the robot themselves and then program it to do a number of different actions. The technology for the robots is open-source, and you can use a free app to program the robots. What we love about it: These two robots can teach kids to code in a fun way. Spin Master's representatives said the robot itself is pretty easy to put together, taking about 3.5 hours to get it up and running. Finalists: WowWee's MiPosaur balancing robot dinosaur; the app-controlled Ollie robot; and the Robotis Darwin Mini humanoid dancing robot. Winner: Uncle Milton's Super Moon In My Room, available fall 2015, $54.99. This new version of the Moon in My Room is 30 percent larger than the original — an appropriate number because actual supermoons are about 30 percent brighter than the average full moon. Super Moon in My Room has an eclipse setting that looks strikingly like a solar eclipse and kids can synch up the toy's moon phases with the actual natural satellite in the sky. What we love about it: Super Moon in My Room has a great educational component to it. Kids can learn more about the phases of the moon and different features of the lunar surface, thanks to a program that comes with the toy. Finalists: ThinkFun's LaserMaze Jr. laser-directing board game for kids; LEGO's Space Shuttle city set; Toys & Models Co.'s Orion Spacecraft model; and Recent Toys' Great Minds Puzzles modeled from space missions like Kepler. Winner: Sky Rocket's Sky Viper video drone, available August 2015, $89. The Sky Viper Video Drone looks like a great drone that is relatively stable for people just learning how to fly one of these machines. And at about $90, it won't break the bank. The drone's HD camera can be used for still photos, and an upgraded version of the toy, exclusive to Toys R Us, will have streaming capabilities. What we love about it: This drone is accessible, and also comes at a price that even a new drone flyer would love. It has many of the coolest features of a high-end drone without the barrier to entry. Arklu's Stargazer Lottie doll teaches young girls about famous women in astronomy through the ages. Winner: Arklu's Stargazer Lottie doll, available March, $24.99. Stargazer Lottie is one of many Lottie dolls created by Arklu. This particular doll was created with help from the European Space Agency and a young girl that helped design the doll. The toy comes with her own telescope and a piece of paper outlining a series of famous female astronomers. What we love about it: This doll was one of our favorite things at Toy Fair, hands down. The creator's mission to get young girls interested in astronomy is laudable, and the doll itself is perfect for a young child first exploring the cosmos. Finalists: GoldieBlox Nacho's Windup Rocket Ride; Uncle Milton's Glow and Grow and Grow Groot; SmartLab's Glider Drop and Secret Message kits; and Celestial Buddies' Uranus and Neptune plush toys. Winner: ThinkGeek's "Star Trek" Phaser Remote Replica, available now, $149.99 This super-fun remote is actually modeled after one of the last known prop phasers from "Star Trek." Just like the original phaser, the remote comes complete with a light-up dilithium crystal. You can program the phaser to any IR remote, and it actually senses your motions, meaning that you can program it in fun ways. For example, you can turn the volume on your TV up by moving the remote up above your head. What we love about it: This toy takes itself seriously. The phaser makes real "Star Trek" sounds and, simply put, it makes something as mundane as changing the channel on your TV fun. Plus, it's the perfect gift for any "Star Trek" super-fan in your life. Finalists: Anki Overdrive car set, a new take on the slot car; USAopoly's Dr. Who Villains Monopoly, Clue and Firefly Monopoly; and Uncle Goose's Odd Galaxy space-themed building blocks. Thames & Kosmos' Remote Control Machines: Space Explorers lets kids build their very own rover modeled after a robot on Mars. Winner: Thames & Kosmos' Remote Control Machines: Space Explorers, available June 2015, $99.95. This build-it-yourself robot is perfect for kids just getting into robotics and space. The box will come complete with an explanation of robotic Mars exploration throughout the ages and instructions for how to build a robot modeled after Mars rovers of the past. What we love about it: This fun robot will help kids learn more about space while also creating a robot with their own hands. It's educational, fun and definitely a good DIY project, even if the price is somewhat steeper than other DIY science kits.